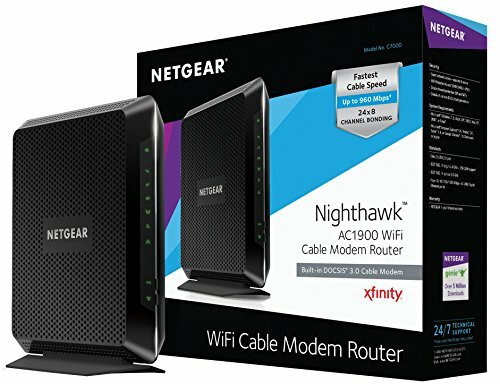 The Netgear Nighthawk C7000 modem is a popular combo wifi-modem compatible with most internet providers. This Docsis 3.0 modem has 24x8 channels, allowing for speeds up to 960mbps. The built in WiFi uses the AC1900 standard which allows for dual band speeds up to 1900mbps - enough to get maximum speeds for plans up to 600mbps. There is no voice support - we recommend the C7100V model if eMTA is needed.